This poster contains several common analogies to help students understand the concept of analogies. 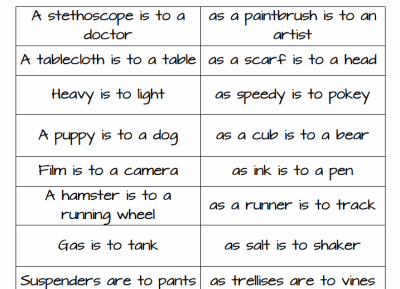 Analogies such as: "A puppy is to a dog as a cub is to a bear" and "Film is to a camera as ink is to a pen" are included plus many more. Preview only, all worksheet pages may not be shown. 0 comments about this printable.